In just 13 days, Star Wars: The Force Awakens has shattered box office records left and right, and there doesn't seem to be any end in sight. 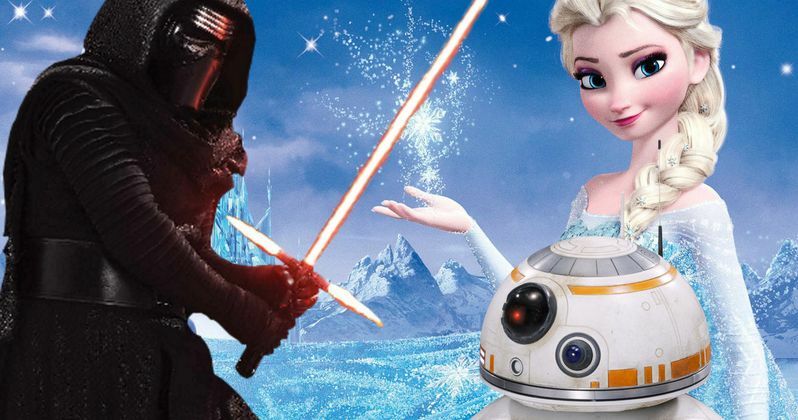 The Hollywood Reporter reveals that Disney's epic blockbuster has now earned over $1.29 billion worldwide, in just 13 days, which passes the studio's animated hit Frozen as the eighth highest grossing movie of all time. After taking in $64.8 million worldwide on Wednesday ($28.1 million domestically and $36.7 million internationally), this sci-fi adventure has taken in $629 million in North American theaters and $664.1 million in overseas markets. Domestically, Star Wars: The Force Awakens' $629 million take has surpassed Marvel's The Avengers' $623.9 million take to become the fourth-highest grossing movie of all time. It shouldn't take long for director J.J. Abrams' sci-fi adventure to pass Jurassic World's $652.2 million tally and Titanic's $658.6 million mark to become the second-highest grossing movie ever in North America. Avatar still holds the record for biggest domestic gross ever with $760.5 million, along with the worldwide record of $2.7 billion. If Star Wars: The Force Awakens keeps up this torrid pace, both of these records could fall in a matter of days or weeks. What's even more impressive about these numbers is that Star Wars: The Force Awakens hasn't even opened in one of the world's biggest markets yet, China. The movie has been given a January 9 release date in China, which has proven to become a very important market at the international box office. While the movie doesn't necessarily need an extra jolt at the box office, the Chinese release could very well be what puts Star Wars: The Force Awakens into position to break Avatar's all-time records. In related news, Deadline reports that Star Wars: The Force Awakens is breaking more records in the U.K. The blockbuster has earned 83.5 million pounds ($123.8 million) in its first 13 days, making it the fastest film to make 80 million pounds, breaking Skyfall's record of 23 days. The U.K. has become the biggest international territory for Star Wars: The Force Awakens, which is now the fourth highest-grossing movie in U.K. history, passing Titanic. It still has a bit of work to do before it overtakes the top three movies in U.K. history, Skyfall ($161.2 million), Avatar ($150 million) and Spectre ($138.3 million), but it should leapfrog over those movies in the next few days. Star Wars: The Force Awakens has also broken the U.K.'s IMAX record of 8.2 million pounds ($12.16 million), previously held by Spectre. The BFI London theater is now the highest-grossing IMAX theater in the world for Star Wars: The Force Awakens. Deadline is also projecting that both the domestic and international grosses will each get to $700 million this weekend, which means that Avatar's all-time domestic mark could be poised to fall very soon. Only two movies in history have grossed over $2 billion worldwide, Titanic ($2.1 billion) and Avatar ($2.7 billion). Could Star Wars: The Force Awakens be the third and become the biggest movie of all time? Only time will tell.